Using mosquito nets and repellents – you can prevent mosquitoes from entering your home, but what about when your child is outside the home? Most outdoor areas have become breeding grounds for mosquitoes and since children spend a lot of time playing outside they get lots of mosquito bites. Here are tips to prevent mosquito bites. Even if you make them wear full sleeve clothes, there are many exposed parts of children’s skin that are well within reach. Infact, mosquitoes can be find their way anywhere and it is not uncommon to find mosquito bite marks on other covered areas as well. This is a child’s second home, the place where he/she spends a lot of time. Since there are lots of open spaces in schools, a lot of mosquitoes can be found in the classrooms, playground, and washrooms. In spite of ventilation and cleanliness, mosquitoes seem to find a way. Children can even contract deadly diseases such as dengue and malaria through mosquitoes. They need to have a good natural mosquito repellent on them to keep mosquitoes away. The place where kids love to hide is also the best hideout for mosquitoes – behind the bushes! Greenery and plants attract mosquitoes Parks are therefore full of them. Just walking barefoot on the grass can leave your child’s foot with various bite marks. Children love to play in muddy puddles and water and that’s where mosquitoes breed the most. Kids who go for activity, dance and storytelling classes can also get bitten by mosquitoes outside. Roads sometimes have potholes with dirty water and mosquitoes can breed in such places. Sports club and other swimming complexes have lots of trees and open spaces which also make a great place for mosquitoes to stay. Nothing can be more irritating than seeing your child dressed in beautiful ethnic clothes with mosquito bites on the face! Nowadays most weddings take place at farm houses. Again, these are open spaces with lots of sumptuous food. Here, one can also find some stagnant water and dirty spaces behind the main premises where mosquitoes can breed. Kids love to go to carnivals and enjoy the rides at such open air events. Unfortunately, the washrooms in such places aren’t kept as clean as a home and thus a lot of mosquitoes are found here. Most carnivals are held in parks and they have a lot of greenery along with dirt and filth with open dustbins. That’s where mosquitoes get the place to stay! 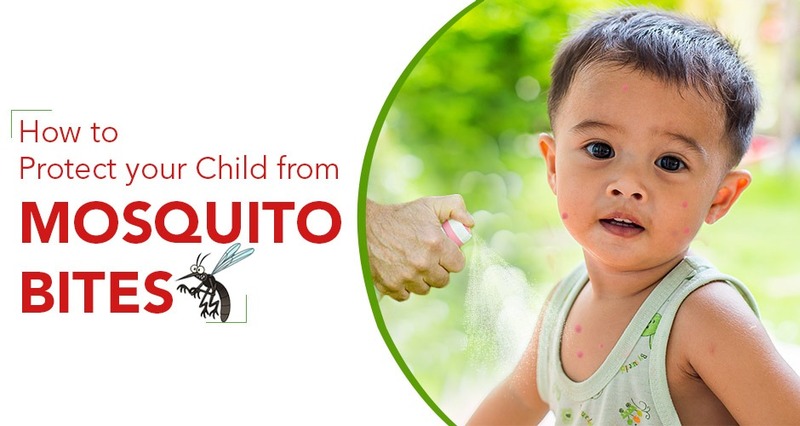 Apply a good mosquito repellent: There are various mosquito repellent available in the market that claim to offer good protection but most of them are just manufactured using various toxins. The earlier mosquito repellent I was using had such a strong smell that my little one got allergies from it. Now I have come across a natural mosquito repellent which is not only made of 100% safe ingredients, it is also extremely effective. Keep them covered: As far as possible make sure your children wear full-sleeved clothes. Mosquitoes and other insects are attracted to dark colors.Make them wear light colored clothes as mosquitoes get attracted to dark colors more than light ones..
Keep an eye on the clock: Mosquitoes are very active during morning hours and in the evening around 6 pm. Try to avoid going out during these hours and keep children occupied with activities so that they stay indoors. Do not allow stagnant water: Mosquitoes either breed in dirty water or clean water that is stagnant. Keep water filters covered and empty the water from water coolers. Also do avoid going for swimming once monsoon starts. Mommies, I hope you found these tips to prevent mosquito bites useful. It’s always better to err on side of caution. What methods to you use to protect your children from mosquitoes?